Oh my gosh! He leaves in less than a month. I have things I wanted to do first. Panic sets in. Okay. Deep breaths. Everyone’s children leave the nest. It is not like he has lived with us for a while. Actually he has not stayed here for any meaningful time period since summer after freshman year of college four years ago. However, there is an additional sorrow for me watching him going across the country. It feel like he is leaving all over again. To fix my crazies, I decided to finish one project for him that I had set out to do ages ago, a chaplet for St. Michael. He has always had a special devotion to angels and St. Michael in particular. Just as a reminder, a chaplet is a a set of beads used in a intercessory prayer. Most people are very familiar with the most common chaplet, the rosary. Not as many know that there are actually many chaplets devoted to different saints and even to different orders. I wanted to make a St. Michael’s chaplet for Evan before he left. I sat down the next day with my jewelry making tool and all my supplies (I found a great website that sells all the stuff you need to make both cord and metal linked rosaries and chaplets called Catholicparts.com) and got to it. 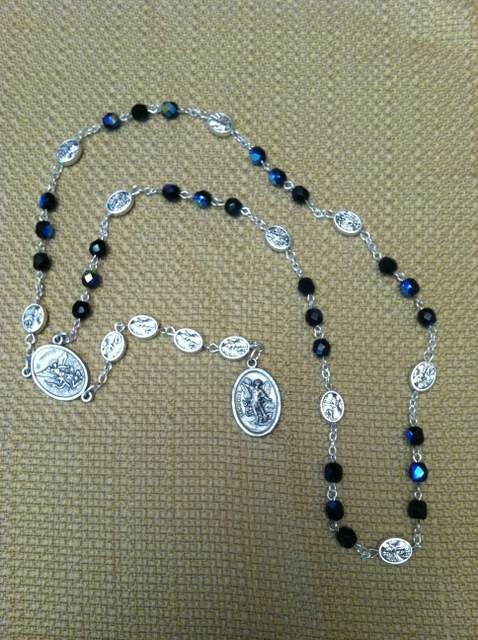 The small beads are black glass with an iridescent finish and the large beads are silver with a picture of St. Michael on one side and a Guardian Angel on the other. I had a St. Michael three-way connector but no religious metal to put on the end. The problem was solved by raiding Evan’s old treasure box in the studio closet. I took one of the many St. Michael metals from within and finished the chaplet. That treasure box was a hindsight 20/20 flash on Evan’s religious bend. It is filled with religious metals, rings, rosaries and other religious articles he had picked up over the years, most with either angels, St. Michael, or crosses on them. We never knew he had them till we packed up his stuff when he moved. Kind of made me laugh to find all these treasures. The chaplet is finished and was handed to Evan with instructions to get it blessed. He seem pleased. I was very happy that he would have something I made for him to go with him to D.C. I am feeling your pain, though my eldest son is only 16. His first job that I have to take him to in the morning, college visits and the like. I am very impressed with how well you are handling it all. I will be following his and your progress through this whole process, as I suspect my eldest is also hearing the call of the priesthood. Thanks, Jeff. If you’re looking for resources for the discerner, there’s some good stuff at http://www.vianneyvocations.com/ The book “To Save A Thousand Souls” is particularly useful and highly recommended by the Vocations office at the Salt Lake Diocese. This entry was posted on July 24, 2013 by KitC in Reflections and tagged chaplet, devotion, rosary, separation.